When all broke up, the protests, the throwing of bottles, the burning of effigies, there was no turning back for the cops to stop the protesters from moving forward and accumulating the spaces in front of them just to arrive at their destination and speak and express their sentiments in front of the person(s) who are responsible for their anarchy. 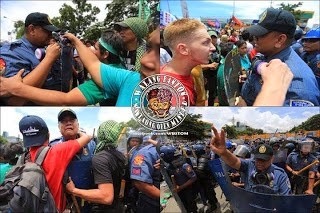 It happened early Monday in Commonwealth Avenue in Quezon City when the protesters at around 11:00 am near Ever Gotesco Mall gathered with all their rage and paraphernalia set to do their motives. And the action went on and on. We can see on the television how the two groups – the protesters and the policemen – clashed though maximum tolerance was given by the policemen to the protesters as ordered by the government. The action continued and everyone was stirred when during the event, on newspapers published was a picture of a crying cop who was lately identified as PO1 Sevilla. According to him, "Sa gutom at pagod. Walang tulog. Walang pahinga. Dalawang araw na kami naka-deploy dito. Tapos ganito, nagkakagulo." With this statement, people, not just the Filipinos were motivated to give their reactions on what the cop have expressed. The news spread all over the world and there were even newspapers and other mass media that tried to make an interview of the said cop. As to me, being a blogger, here is my standpoint: Cops are humans too they have feelings, families and hopes. What happened is just a reminder to us of what misunderstandings can offer to both parties. I do hope and pray that these things will not happen again. Though this might be an elusive dream, but I still do hope.